I saw them circling. Relentlessly wheeling, turning, grinding ruts in the sky. Vultures. Birds of prey, snatching at life. Ebony feathers tracing, ever tracing, paths in the clouds. Never progressing, yet always present. It’s what they do year in and year out. I have some circumstances like that in my life. Circling. Relentlessly wheeling in my mind, grinding ruts in my heart. Preying on my joy, snatching at my peace. Season upon season. Always, always, circling, ever present. Will I ever be free? But something else caught my attention. High above the ebony feathers, I saw it soaring, maneuvering, gliding. Flying with an eye to go higher. It didn’t engage the vultures below. It didn’t get tangled in their fruitless circling. In the presence of the death birds, the eagle spread it wings cut the sky with skill and grace. I heard God’s message to me. Fly above it. Don’t engage in fruitless entanglements. Keep my eye on my higher calling. Always follow my Jesus. Leave the vultures to their circling and soar on eagles wings to my Father. Amen and Amen. 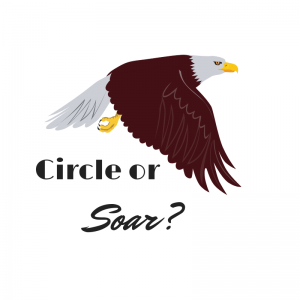 What is God calling you to leave behind and rise up on wings like an eagle? Leave me a comment below; I’d love to hear from you.